The 600 Luxe is not your classically designed pocket scale. It's thin, durable and accurate with a easy pull out faceplate that hides the controls. Although this scale is small, it can be used to weigh up to 600 grams and it's removable cover can be used as a tray to make weighing easier. 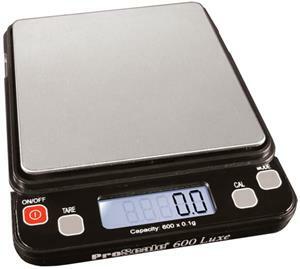 ProScale is a renowned quality scale manufacturer and offer a 5 year warranty.